Blurb: Cas Lowood has inherited an unusual vocation: He kills the dead. So did his father before him, until his gruesome murder by a ghost he sought to kill. Now, armed with his father's mysterious and deadly athame, Cas travels the country with his kitchen-witch mother and their spirit-sniffing cat. Together they follow legends and local lore, trying to keep up with the murderous dead—keeping pesky things like the future and friends at bay. When they arrive in a new town in search of a ghost the locals call Anna Dressed in Blood, Cas doesn't expect anything outside of the ordinary: move, hunt, kill. What he finds instead is a girl entangled in curses and rage, a ghost like he's never faced before. She still wears the dress she wore on the day of her brutal murder in 1958: once white, but now stained red and dripping blood. Since her death, Anna has killed any and every person who has dared to step into the deserted Victorian she used to call home. And she, for whatever reason, spares his life. 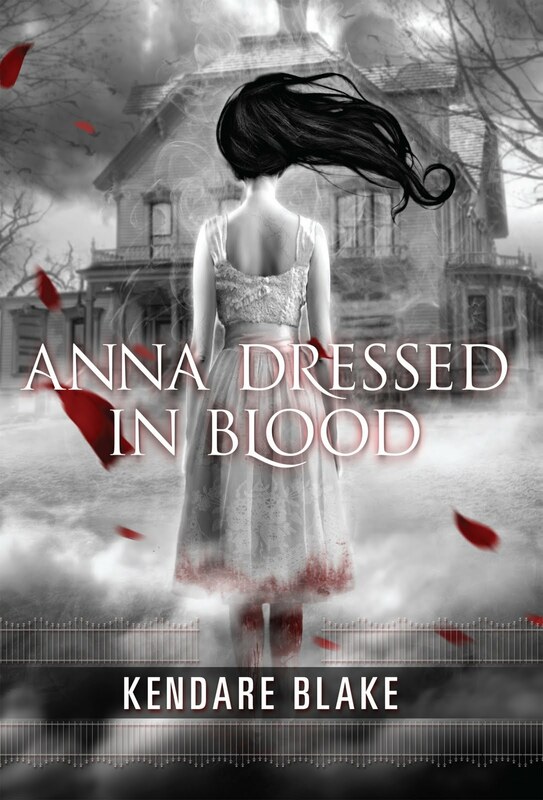 My thoughts: I have to say I don't like Anna Dressed in Blood (cover, title and the whole story) I'm totally in love with it. And it's not a lie to say Anna Dressed in Blood is my favorite book of all time! It is a book which exceed all my expectations. (Cas' mother) "Superheroes got to college too." (Cas) "I'm not a superhero," I say. It's an awful tag. It's egoistical, and it doesn't fit. I don't parade around in spandex. I don't do what I do and receive accolades and keys to cities. I work in the dark, killing what should have stayed dead. Well, Cas kills the dead and at the beginning of this novel you will meet Cas and 'watch' him killing the hitchhiker ghost. It is an exciting read and it's really hard to stop reading for a second, but I had to do some rests. After Cas has finished his job he go for another: to kill Anna, Anna dressed in blood. You can see Cas is having no fun by killing the dead, but it is his job and somebody has to do it. I glance between them and the house. As much as I'd like to investigate further, I'm going to stop. This isn't right. Now they're here and afraid, they're laughing at her, trying to turn her into a joke. Crushing their full beer cans against their heads feels like a great idea, and yes, I feel the hypocrisy in my wanting to defend something that I'm trying to kill. For the first time when Cas meets Anna, he was tricked by some classmates. They knocked him out and when Cas comes around he is lying on the floor in the middle of Annas house. Everyone who goes inside that house will be killed by her. When Anna appears my blood runs cold and I nearly was freaking out, when she was killing Mike (one of Cas' classmates, who was standing outside in front of a window looking at Cas' drawing his last breath) and finally turns over to Cas. Anna is an incredible creepy girl, but there is something that makes her sympathic - even more because she spares Cas life. Cas would like to find out more about Anna - What's the reason for sparing his life and not the others, how did Anna died and what is making her kill? Her story affects me directly. It's full of tragedy and sadness. Anna does not deserve what had happened to her. Anna is my favorite character in the story, Cas is just a sympathic character not more or less until his tender feelings coming up for Anna. I can't help myself from wanting to protect her, wanting to save her from becoming what she already is. Anna Dressed in Blood is terrifyingly thrilling, utterly compelling and as scary as it gets, but as I mentioned above my favorite book of all time. Furthermore I have to agree with Stacey Kades comment: "Get ready to sleep with the light on because this book has teeth. Sharp ones." Oh yes, it has and I can't help myself but there is one scene close to the end that reminds me a bit of Tim Burtons bogeyman in The Nightmare Before Christmas - just worse. I don't know exactly why, but it does and the nights can be damn long! So happy reading and being scared!